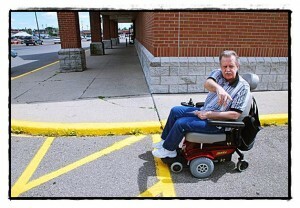 It’s a lawsuit waiting to happen, say seniors and the handicapped. And so far, the person who could prevent that from happening isn’t doing anything. But first, meet Donald Kazmierski. He’s 68, but doesn’t look anywhere near that old. However, he has to travel by a motorized wheelchair when he goes long distances. Older age, you know. Things break down. He scoots from the Hamtramck Senior Plaza to the Hamtramck Town Center every week, which is right next door to his apartment building. Not bad in the nice weather we have now, but imagine doing it in the slush of winter. Good weather or bad, once he gets into the Shopping Center parking lot, there is no immediate way for him to get his wheelchair up onto the sidewalk. You see, the Center owner didn’t do a curb cut on the sidewalk on the north side of Rite Aid. Instead, he and other handicapped folks have to swing into the driving lane out front and go to the front entrance of the store where wheelchairs can get up. And that’s where things get a little hairy with motorists driving by, sometimes a little too close for comfort and sometimes a little – or a lotta – too fast. “I almost got hit last winter by a SUV,” Kazmierski said. And when there’s heavy snow on the ground, that accident waiting to happen only gets worse. Hmmmmm … imagine that, a handicapped person struck by a SUV because there’s no proper handicap sidewalk entrance into the shopping center. The driver of the vehicle that struck the handicapped person, check. The shopping center owner, check. Oh, let’s throw the City of Hamtramck into the mix as well, just to see how many deep pockets can be tapped. For about $300 to $500, the problem could go away. We called the owner of the center, Arkan Jonna, and were greeted by a woman who did not identify herself. Jonna, she said, was too busy to talk, but she assured The Review the matter would be looked into. Thank you very much, we said. Next, we talked to Hamtramck City Manager Bill Cooper who said that because it’s on private property there was nothing the city can do. “Handicap accessibility is only required for government buildings,” Cooper said. So, there is no code violation issue here. 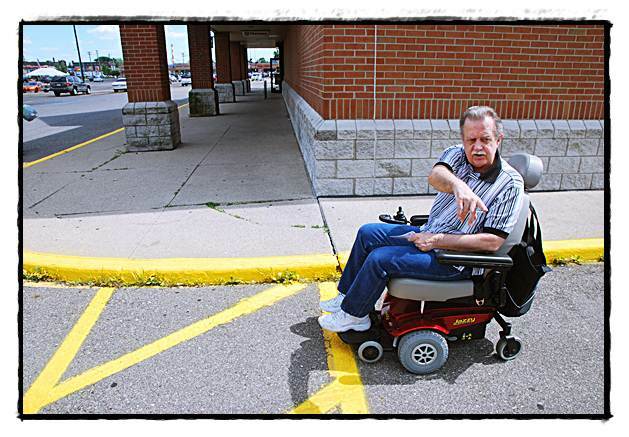 Well, how about calling Jonna on behalf of Kazmierski and 100 other people who signed a petition asking for handicap accessibility at the curb?” we asked. Cooper said that if the petition fails, he’d be more than happy to intercede. Meanwhile, Kazmierski has another idea. “I was going to get a sledgehammer and break it up myself,” he said, referring to the sidewalk curb. Well, before things get to that point, Kazmierski plans to call a few local television news investigators to see if they’re interested in a story about the handicapped senior who was almost run over. Hopefully, the story has a happy ending.